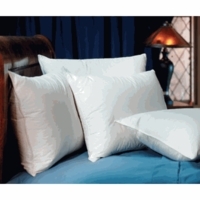 The Blue Label Firm Pillow from Restful Nights ® is a staple in Comfort Inn ® Hotels. The firm support of these pillows is ideal for side sleepers and back sleepers who prefer a little more loft. If you've ever slept on one of these pillows in Comfort Inn ® Hotels then you know the supreme comfort that this pillow offers. Now you can get that same comfort in your own home!